​​​​ TYLER – Burns Commercial has released its 2017 Office ​Market Survey​. This compares with a rate of 85.4 percent in 2016. The amount of vacant space in the market stands at 449,496 sf, an increase of 37.35 over 2016. 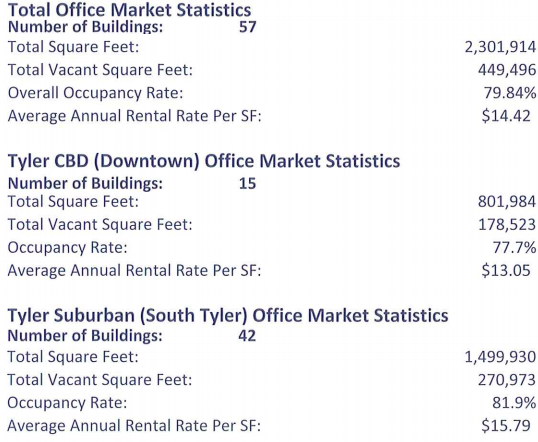 This is likely the largest inventory of office space available in Tyler's history. Class A office buildings now have an occupancy level of 83.3 percent, compared to 87.1 percent in 2016. In the Class B structures, the occupancy rate dropped to 79.9 percent from 84.3 percent in 2016. Class C properties are down to 76.7 percent occupancy, compared to 84.0 percent in 2016. ​​See the current and historical Burns Commercial property Tyler Office​​ Survey here​.